A hunting knife is only as good as its edge. Maintaining the sharpness of the blade on your hunting knife is crucial to avoiding unwanted injuries when skinning and cleaning an animal, and is an important part of caring for your hunting gear between trips. Hunting knives come in many different forms, from serrated blades, to hook blades that are specifically used for cleaning carcasses after a hunt. However, all of these knives must be kept in peak condition to avoid the risk of causing injury to yourself or undue wear to the surface you are cutting through. Maintaining the edge of a hunting knife is rather simple as long as you have the correct equipment. While it is easy to walk into the nearest department store and pick up a cheap sharpening stone, when it comes to maintaining your hunting knives something a bit more specialized can help increase the long term usability of your knives. A good sharpening tool for your hunting knife (like our top choice – the KME Precision Knife Sharpener) is transportable, easy to use, and does not run the risk of damaging or weakening your blade. Sharpening a blade does involve shaving a small amount of the metal surface off the edge of the blade in order to increase the sharpness, however a good knife sharpener does not cause additional surface damage to the knife itself, allowing you to have the cleanest edge possible on a smooth knife. Sharpening your blade can also help to make sure that the serration edge of your knife is properly maintained for the best possible results when in the field. Knife sharpeners come in many forms, from manual sharpeners to electric sharpeners. While there are a wide range of varying qualities for knife sharpeners, whether you should use a manual or electric style largely depends on your own personal preference. While electric sharpeners are faster to use and eliminate some of the risk of human error, manual sharpeners allow you to specially tailor your sharpening style to fit specialized hunting knife edges. We’ve gone ahead and rounded up our top 5 knife sharpeners, including both manual and electric options, so you can get a glimpse of the full range of knife sharpening options available for your hunting knives. Our list of top 5 hunting knife sharpeners take into account user-friendliness, review quality, and price point, as well as any unique features offered by each individual knife sharpening kit itself. When it comes to deciding between manual or electric, your personal preference is oftentimes as important as tailoring your needs to the style of knives that you intend to sharpen. Bear in mind, for both styles of knife sharpeners, knowing the proper technique to sharpen a knife is it crucial to avoid damage to yourself and to your knives. Without further ado, here are our top 5 hunting knife sharpeners. The KME Precision Knife Sharpener System with 4 Gold Series Diamond Hones sits squarely at the top of our list of hunting knife sharpeners due to its portability, the quality of the sharpening edge, and the wide range of options available within the kit. With 4 different honing surfaces to help tailor your blade to the sharpest point possible, this sharpening kit helps you maintain even the most finicky of hunting knives. The KME System is an example of a high-quality, efficient knife sharpener that is perfect for maintaining a wide range of hunting knives. With 4 Gold Series KME 1×4 diamond hones that come in 140 extra-coarse, 300 coarse, 600 fine and 1500 extra fine grades, you can sharpen your knives to a new level of excellence. With a mounted base so that you don’t have to worry about the sharpener slipping while you’re working, as well as a compact carrying case to allow you to take the sharpener with you on the go, the KME unit easily makes the top of our list as one of the best sharpeners to help you maintain your hunting knife collection between excursions. With an adjustable mounting system for the sharpening services, you’re sure to get the best angling on the edge of your blade possible. The flexibility of the mounted display alone allows you to reach areas on the blade of your hunting knife, such as hooked tips and serrated edges, that you cannot easily reach with other sharpening tools. This allows you to make sure that all of your hunting knives are in pristine condition. This sharpening kit takes maintenance to a new level with its unique luxury options that allow you to control the way your hunting knives are sharpened down to the most minute detail. It’s easy to see why we have the KME Precision Knife Sharpener System with 4 Gold Series Diamond Hones at the top of our list. Very portable - stores in included hard carry case. The Edge Pro Apex 1 Knife Sharpener Kit Allows you to sharpen blades up to three and a half inches in thickness, and works for all types of blades from smooth edge blades to serrated hunting knives. 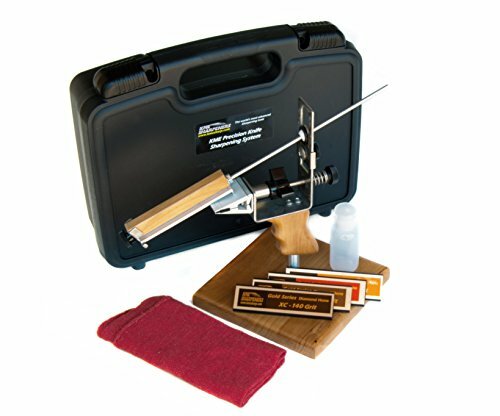 With a precision angling setting for the edge of your blade, you can make sure that you have the same sharpening experience every time that you use this kit. 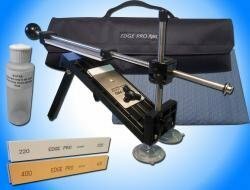 While less portable than our number one option, the Edge Pro allows you to speed up the sharpening process without having to trade speed for quality, as you can set its precision edge guide system to the same setting every time you sharpen your knives. With an easy-to-use sharpening system that helps prevent injury and is excellent for situations where you may need to sharpen multiple knives quickly and in a rapid succession, such as before a hunting trip. With an easy grip and slide system, you do not have to worry about moving your knife back and forth at an equal pace across the whetstone. Instead, with this sharpening kit you simply hold the knife in place up against the angling tool, and move the whetstone across the blade, allowing you to get the exact same stroke every time. This can help maintain your hunting knives, and is perfect for sharpening more finicky blades that may have a difficult angle to work with using a strictly manual sharpener. Although it is clearly not as portable as our first option, it still comes with a carrying case for ease of storage in your truck or hunting kit, though it may take a bit longer to assemble in a pinch. The Premium Knife Sharpening Stone 2 Side Grit 1000/6000 Waterstone falls squarely at the number 3 position on our list due to its versatility and its ease of use. This sharpening stone is fairly straightforward, and is more akin to traditional knife sharpening tools than some of the more technical options that we have on this list. It is easily transportable, and does not require any special care or oil to use. Simply apply a small amount of water to the surface to begin sharpening your knives. While not as practical for more complicated knife edges, such as serrated blades or hooked tips, the Premium Knife Sharpening Stone can be used for both hunting knives and high quality kitchen knives, giving it another level of versatility outside of the hunting kit. 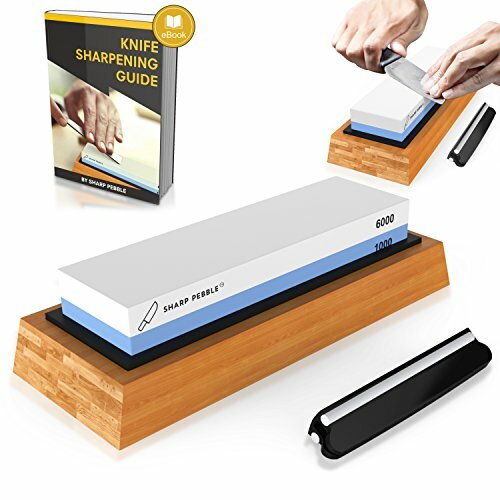 With a 5-star ratings on Amazon and dozens of trusted reviews, this sharpening stone is perfect for your hunting knife sharpening needs, and can help take some of the hassle out of maintaining your knife collection. With a secure base to allow you to sharpen nearly any tool, from a simple pocket knife to an axe or machete, as well as a compact design that is under 8 inches in length, this knife sharpening stone is perfect to stick in your pack for easy knife maintenance on the go, or to keep in a corner of your kitchen to help make sure that your cutlery is in pristine condition when it comes to cooking your prize. While not as complex as some of the other options on this list, the Premium Knife Sharpening Stone 2 Side Grit 1000/6000 Waterstone is still one of the highest quality knife sharpeners available, and will make sure that your hunting knives stay in peak performance condition. While the Chef’sChoice 15 XV Trizor Professional Electric Knife Sharpener is not necessarily marketed towards hunting tools, it is a high-quality option available to help create and maintain a sharp edge on your hunting knives. Boasting the ability to turn regular kitchen knives into high-functioning state-of-the-art cutlery, this electric sharpener allows you to sharpen the edge of straight bladed knives in as little as 10 seconds. 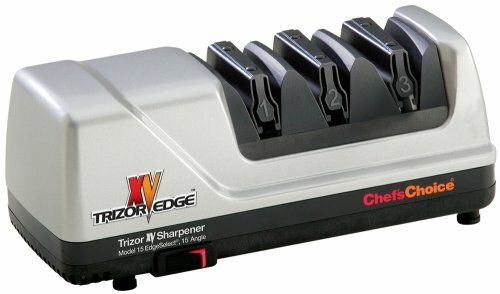 The Chef’sChoice 15 XV Trizor also allows for a quick sharpening for serrated blades, something that you do not find often in electric sharpeners. With diamond-infused sharpening technology, you are sure to get the cleanest and sharpest edge possible for your hunting knives or your kitchen tools. This sharpener, much like our number three choice, is perfect for both before and after your hunting trip, as it can keep your hunting knives in peak field condition, as well as spruce up your kitchen knives, allowing you the best position possible both on the field and on the barbecue. What this option lacks in ease of transport it makes up for in quality and speed. While your first time sharpening your blade with the Chef’sChoice 15 XV Trizor may take upwards of one minute to complete, future sharpening endeavors can take as little as 10 seconds, and will create a razor-sharp edge for even your oldest hunting knife. This sharpener option is perfect for people who have a large collection of hunting knives to maintain, and would like to have a more luxurious option for keeping the edges of their blades in pristine condition. Though not ideal for use on the go, the Chef’sChoice 15 XV Trizor Professional Electric Knife Sharpener takes knife sharpening to a whole new level to ensure that you have the best cut every time. The Work Sharp Ken Onion Edition Sharpener lands at the base of our list today not because of a low quality option, but because of the lack of specialization of the sharpener. 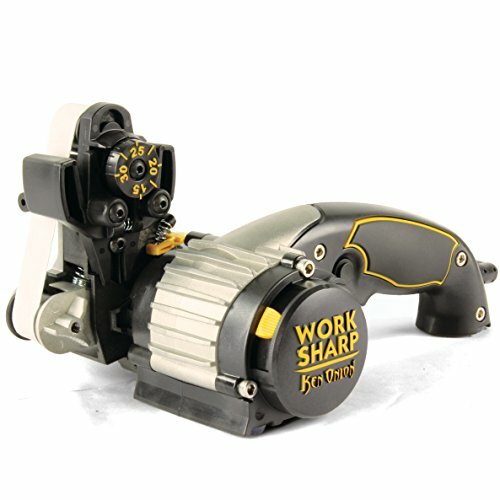 The Work Sharp is one of the highest quality knife and tool sharpener on the market, and uses a system of abrasive belts to polish the edge of blades and tools, such as hatchets and hand saws, to an incredibly sharp edge. While this sharpener does offer a wide range of versatility, it is not necessarily used to sharpen more specialized hunting knives, and does not offer the same specialized edge care as some of our other selections. However, if you are looking to make an investment in a tool sharpener that can also be used to help maintain your hunting knives, the Work Sharp Ken Onion Edition is the perfect tool for the job. The Work Sharp comes with premium sharpening guides to make sure that you get the same edge every time on your blade, and to make sure that sharpening your blades goes quicker than ever. While not as easy to tailor as our other options, the Work Sharp does allow for the honing of various serrated edges, as well as for sharpening the edge of other necessary outdoors supplies, such as fishing hooks. With easily replaced sanding belts, this sharpener is sure to last you a long time, and is less likely to need replacement down the road. With a four-and-a-half star rating, if you are looking for a tool sharpening kit that can also be used to help keep your your hunting knives in prime condition, the Work Sharp Ken Onion Edition Sharpener may be right for you. When sharpening your hunting knives there are a few things to keep in mind. First, the surface of the knife sharpener should be clean and dry to allow the best edge for sharpening your knives. You’re knives should also be cleaned to avoid any interference with debris that might be left on the blades. Pressing down too hard or dragging to roughly across the grinding surface may cause additional damage to your blade, and may result in a chipped or worn edge instead of sharpened one. Going in one continuous motion and making sure to keep in mind the grain of your knife’s edge is key to getting a clean, sharp edge. Keep in mind the type of the blade that you have and any possible unique edges that you may have to take into consideration before you start sharpening, such as a serrated edge, a hooked tip, or an older knife that requires a bit more intensive care before you start sharpening. Making sure that your blades are sharp as possible before you use them is key to making sure that you’re cutting experience goes as smoothly as possible, as well as to prevent injuries, as a dull blade is the largest cause of knife related injuries. Testing the edge of your blade on a piece of hair or something similar can give you a good indication of if it is time for them to be sharpened again. While most knives do not need to be sharpened after each use, general maintenance is recommended to make sure that you get the sharpest cutting edge possible. In the case of a serrated knife, making sure that each individual tooth is sharpened carefully can help make using it much easier, as a dull serrated blade is akin to trying to cut through a hard surface with a butter knife. Caring for your knife sharpener is also key to make sure you get the best edge possible when sharpening a blade. Your sharpener should be stored in an area where dirt and grime cannot become lodged into the grinding surface, and where it is dry and protected from the elements. If jostled too much, or dropped, the surface of the sharpener could become chipped, which in turn can damage the blade of your hunting knife if the chipped surface is used to try and sharpen the edge. When it comes to caring for your hunting knives, having the best sharpener and sharpening technique can help preserve the edge of your blade, and give your hunting knives a longer usability life. As with any form of product maintenance, improper use of the sharpening stone can result in possible damages to your knife blade or to yourself, so it is important to follow all instructions when it comes to sharpening your hunting knife.